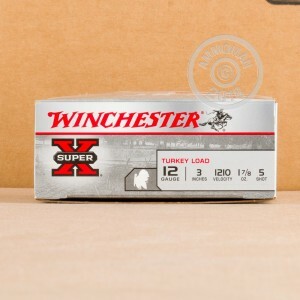 Be ready for turkey season with 12 Gauge Winchester Super-X Turkey Loads! This #5 copper plated shot will give you the power you need to bring home a long beard, even when you are shooting at long distances. The muzzle velocity reached with the 3" load is 1210 feet per second. 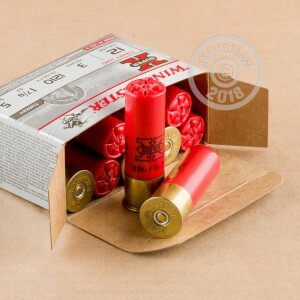 As with other shotgun ammunition in Winchester's Super-X line, you will get performance that is dependable and consistent. The 209 Primer and clean burning powder make ignition reliable and velocity consistent. A one-piece hinged wad will help reduce felt-recoil to make your shot more comfortable and accurate. 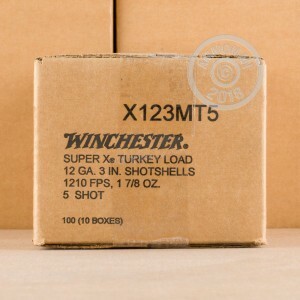 Winchester never fails to deliver products that are high quality, yet affordable. The same holds true with this product. Winchester was founded in 1866 and continues to be a top leader in the ammunition industry. You can't go wrong with the "The American Legend".